Many families travel during the winter holidays to see family or during the depths of the cold season to escape the blahs in favour of a warmer climate full of sun. 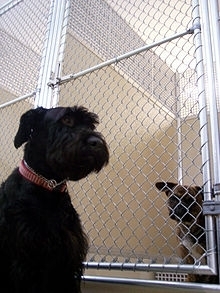 On these trips, however, the family dog can’t always come along with you, we need to board them at a kennel. Sometimes when one returns from a vacation they bring back a virus or infection with them, usually as the result of sharing a small space with a large number of people. The same can be true of our dogs from their kennel visit. This is why many families consider the Kennel Cough vaccine when boarding their pets, and why a majority of kennels require it. What the Kennel Cough vaccine works to combat is Canine Contagious Cough Complex, a damaging case of inflamed airways, specifically irritating and harming the trachea and bronchial passageways in the lungs, known as tracheobronchitis. This condition can be caused by a multitude of different organisms but most frequently the bacteria Bordetella bronchiseptica and the viruses parainfluenza and adenovirus. The condition is known colloquially as Kennel Cough because this type of environment facilitates its spread through minute excretions from the respiratory tract, like coughing, transmitting in much the same way as a human cold or flu would. Once contracted, the airway and lung irritation and superficial damage will typically remain for up to 3 weeks if caught and treated early, usually with cough suppressants and antibiotics. The slightest passage of air through the respiratory tract can trigger a cough, often exemplified by a hacking attempt at a throat clearing. So how does one determine if their own dog is a good candidate to receive the Kennel Cough vaccine? Again using the human parallel of the flu virus, just because a vaccine exists does not mean that it is the right fit for every individual. There are many factors to consider when deciding whether or not to vaccinate your pet. The vaccines available to prevent Kennel Cough only include protection against 2 of the more than 10 organisms that can cause Kennel Cough, even if they are the 2 most common. The vaccine is no guarantee against contraction of the condition but it does improve the odds. Some pets already receive vaccination against parainfluenza as part of their regular regimen, be sure to check your pet’s vaccine history and if your vet can administer the Bordetella vaccine on its own. The vaccine provides 1 year of protection and would need to be administered on an annual basis to ensure coverage. If planning a trip, call ahead to your veterinarian to verify if your existing Kennel Cough vaccines are up-to-date. Is a vacation already booked? Don’t wait until the last minute to book the vaccine as it can take up to 10 days to provide protection. It is much easier to find a cat-sitter to drop by the house once in a while to check in on how the much more independent felines are handling the time on their own. Our dogs need more care and attention and if a dog-sitter cannot be found sometimes this means finding a boarding kennel. Talk to your veterinarian today to determine if the Kennel Cough vaccine is right for you and your pet.